The alligator snapping turtle is the largest river turtle in North America, weighing in at up to 200 pounds and living almost a century. Now researchers from Florida and the University of Vermont have discovered that it is not one species—but three. Examining museum specimens and wild turtles, the scientists uncovered deep evolutionary divisions in this ancient reptile. Once heavily hunted for turtle meat—alligator snapper was the main ingredient of Campbell's Turtle Soup in the 1960s—the riverine populations have been deeply depleted and are of conservation concern. The new discovery indicates that these animals are more imperiled than previously understood. The two new species both live in the southeastern United States. 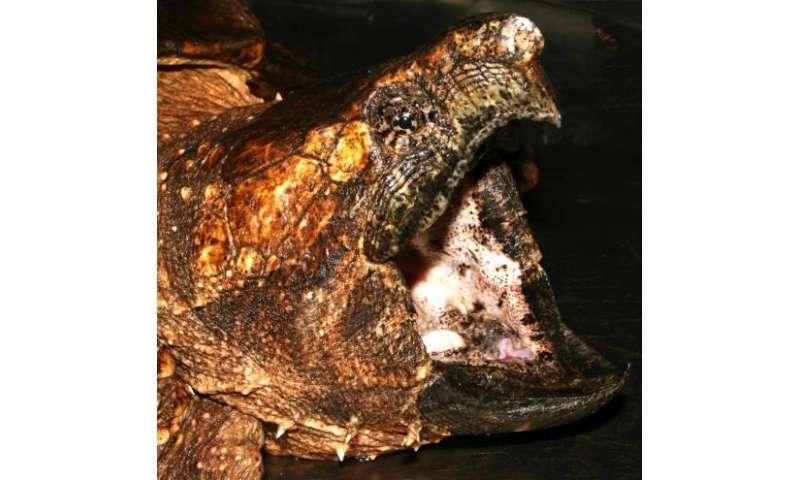 The Suwannee alligator snapping turtle is found in Florida and Georgia—and lives only in the famed Suwannee River; it has been a distinct species for at least five million years, the scientists discovered. The Apalachicola alligator snapping turtle lives in Florida, Georgia, and Alabama—in and around the Apalachicola River—and developed as an independent species at least three million years ago. The genetics work to identify the new lineages of turtles was completed by Joe Roman, a conservation biologist at the University of Vermont, and colleagues. The research was led by Travis Thomas, a Florida Fish and Wildlife Commission scientist, and is reported in the April 9 edition of the journal Zootaxa. "We found a surprising result: these really deep divisions between each river," Roman says. "Unlike common snappers, these turtles do not move from river to river; they're isolated and have been for millions of years, through many glacial ages." Roman and his colleagues caught turtles in rivers throughout the Gulf Coast region and collected blood samples from their tails. ("Watch out!" Roman says, "some people claim they can snap a broom handle," with their powerful jaws—and one of his friends said getting his finger caught by a young turtle was like "getting it caught in a car door.") From these samples they collected DNA to determine that both male and female snappers in the rivers were genetically isolated from other populations. "The Suwannee River turtle is way different from the others; it's been isolated—as an independent species—into the deep past," Roman says. The molecular revolution that began in the 1980s has used DNA to redraw many boundaries between species. But to be fully confident in the genetic evidence they had gathered, the scientists also examined the turtles for differences in body shape and size. Close studies of the skulls and shells of museum specimens confirmed that "each of the three genetically distinct Macrochelys lineages can be diagnosed morphologically," the team writes in their new paper. In other words, experts can look at the turtles, particularly the back edge of the shell, and tell the species apart. Until early in the 20th century, alligator snapping turtles were plentiful from headwaters in the Midwest into swamps of the Deep South, but "river turtles were hit hard in the 1960s and 1970s," Roman says. Hunters, often smalltime operators, "could clean out a stretch of the river in a few weeks time by just setting traps and waiting," he says. Florida was the first state to shut down commercial trapping and eventually all other states followed—the last one being Louisiana. "Turtle soup was traditionally served to politicians at political dinners," Roman says, "so a senator in Louisiana fought against protecting them." Today, Roman sees bipartisan support for protecting the turtles against current threats like water pollution, illegal harvest and collection for the pet trade, and river drawdowns upstream. "These are the symbols of their rivers," he says, "and part of the cultural history of bayous and backwaters." But they're also deeply connected to the ecological and economic health of these regions, he notes. "As top predators, they're a key part of the ecosystem," Roman says. "By protecting the rivers and their unique species, you're protecting fisheries, oyster beds and the recreation economy that people living there depend on." About a decade ago, Roman's work led to analysis of turtle meat sold in Louisiana, which uncovered widespread fraud. "Approximately one in three samples of turtle meat sold in the state were actually alligator," he says. In 2012, the Center for Biological Diversity and others filed a petition with the federal government to protect the alligator snapping turtle and fifty-two other reptiles and amphibians, under the Endangered Species Act. Reacting to the new species discovery, on April 16 the advocacy group sent an additional appeal to the U.S. Fish and Wildlife Service. "Now we know alligator snappers in the Suwannee River are a unique species found nowhere else in the world," Collette Adkins Giese, a biologist with the Center for Biological Diversity, said in a statement. "And the much-needed Endangered Species Act listing for these turtles would help ensure that the Suwannee River is protected for the turtles—and for humans." Alligator snapping turtles are secretive and so slow-moving that algae grow on their backs. A sit-and-wait predator, they have a wormlike lure on their tongue that draws in fish, "and then snap!" says Roman. "They hardly ever come onto land, and they don't swim in seawater either," he says, which helps explain how a distinct species arose, in the case of the Suwannee alligator snapping turtle, in just one river. More than 500 baby sea turtles released off Fla.